I guess you could say when it comes to my hair, over the last two years I have gone through an identity crisis. I like any girl love to play around with fashion and makeup but my hair is a different story. I was never great at styling it or taking very good care of it. Naturally, I have mousey blondish hair and always resented the fact that no matter how vibrant my clothes or meticulous my makeup, I could never get past the fact that my hair was, well, boring. So, one day I made the drastic decision to dye it blonde, and I mean really blonde! The type of blonde that seemed like a great idea at first but ended up taking so much time and effort between the root touch ups and the constant full face of makeup required so that I didn't looked washed out. It wasn't before long that I grew tired of all the work involved in keeping up this look (each time I touched up my roots, my hair got even blonder!) I then decided I wanted my old hair back after a year of root touch ups and endless hair extension dying. This turned out to be a disaster, as my hair was so weak and porous from all it had gone through, it turned grey..actual grey! It had finally given up and lost all pigment to which gave me the pleasure of seeing what I had to look forward to in sixty years time. This left me with no choice but to go dark, not by choice but so I could leave the house! I hadn't imaged that I would ever have brown hair as my skin is so fair that I just decided it wouldn't suit me and really, I was right. I decided to make the most of it, however and found I now had the ability to pull off darker eye makeup. But old habits die hard and each time I would touch up the colour it got darker and darker until it was almost black! Then I went on a working Visa trip to America for three months and that all changed. The weather was great and I was having too much fun to care about maintaining the colour of my hair and I just let it grow out. luckily it wasn't too obvious and I soon regained a somewhat more natural hair colour by the time I got home. It wasn't before long that being back in cloudy old Ireland rehashed my desire for more glamourous and exciting hair. But I had learned my lesson and resisted the urge to drastically dye it a rainbow of colours. Instead I opted for a more low key and understated look which would add a hint of blonde without all the fuss. Using the L'Oreal Wild Ombre kit I dye the ends of my hair and I couldn't be happier with the result! Not only is it low maintenance and healthier, it's the blonde hair I always wanted but a lot less damaged. I would definitley recommend this as opposed to dying all of your hair as it's so easy to do and it will just grow out naturally. Thanks very much! 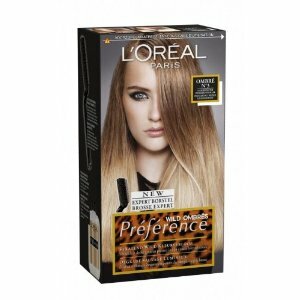 I really like Lauren Conrads hair colour so if your looking for inspiration you should look up images of her, thats what I did. It's not hard at all especially with this L'oreal kit, depending on the colour of your hair, there are three different ones (the one I used is for light hair). But you can use most blonde hair dyes instead. All you do is apply it to the ends of your hair, usually starting at your ears down and make sure you dont get any near your roots. It takes about half an hour to develope, depending on the intensity that you want it. Good luck! Really nice share! Thank you!